High filament yarns for dryness and wicks sweat from the skin to fabric exterior. 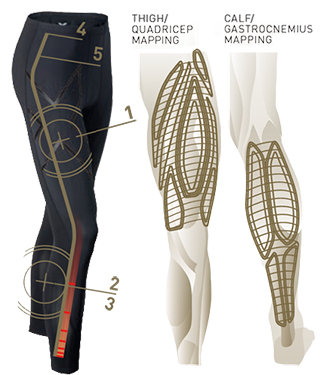 MCS Elite Compression Tights :: Utilizes a combination of 70 Denier PWX FLEX and 105 Denier PWX WEIGHT Compression Fabric with Muscle Containment Stamping targeted to trace over key muscles, tendons and fascia groups to focus on greater compression power and recovery. Made from our 70 Denier PWX FLEX fabric to deliver optimal flexibility and movement.